Jump to "Types of Annual Subscriptions" or "How to Get It"
Why should you pay for a subscription to the Orange Book Companion Online service or Flash Drive when the FDA offers the Electronic Orange Book (EOB) for free? Because we start where the EOB leaves off, and add information from six additional sources to save you time (and thus money) when doing Orange Book research. OBC Flash Drive ($495/year) for "base" subscription; $145 for "additional" subscriptions sent to the same contact person which expire in the same month as the "base" subscription. Orange Book Companion Online subscription serivice: you are given a user ID and password to access the Orange Book Companion's premium data through our web site. Access to patent text and images, and to detailed NDA information, is provided by links to the USPTO and to the FDA web sites, respectively. The account may be used by anyone in your company who shares a common Intranet with the person who ordered the subscription. See the "Terms and Conditions" for the details. Orange Book Companion Flash Drive subscription service : Macintosh and Windows compatible. No fancy software needed, just a web browser and the free Adobe Acrobat(R) Reader. Subscribers to a "base" subscription receive a new OBC Flash Drive each month for twelve months. A "base" subscription must be ordered before any "additional" subscriptions at the lower price. An "additional" subscription will expire in the same month as its corresponding "base" subscription. So later purchased "additiional" subscriptions may not receive twelve OBC Flash Drives. For example, if a "base" subscription is purchased and the first OBC Flash Drive is based upon Volume 38, Supplment 10 of the Orange Book, the twelfth (and last) OBC Flash Drive provided under that "base" subscription will be based upon Volume 39, Supplement 9 of the Orange Book. If an "additional" OBC Flash Drive subscription is purchased, the last OBC Flash Drive provided under that subscription will also be the one based upon Volume 39, Supplement 9 of the Orange Book. 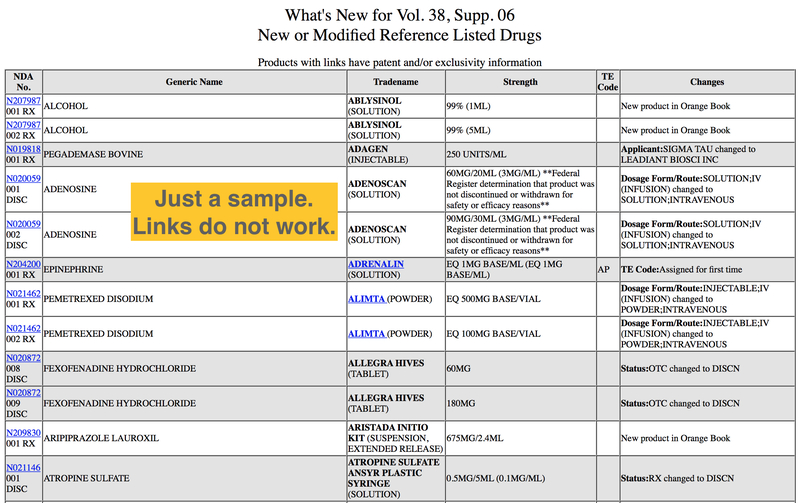 NDA information for every product that has a patent or exclusivity or is a Referenced Listed Drug. Thus, the Orange Book Companion Flash Drive is highly self-contained! (Links within the patent text, which are provided by the USPTO, will require an internet connection). The OBC Flash Drive provides great portability, and makes the information available faster and more reliably since you do not have to worry about access problems at the USPTO or FDA sites (for extreme speed, you may copy the contents of the OBC Flash Drive to a computer or tablet). Alternatively, you may upload the contents of an OBC Flash Drive to your organization's Intranet. Using the OBC Flash Drive can reduce your bandwidth usage at the USPTO. If you are not aware of it, they will block companies who use too much bandwidth. (See the second bullet-point in the notices at the USPTO Database). 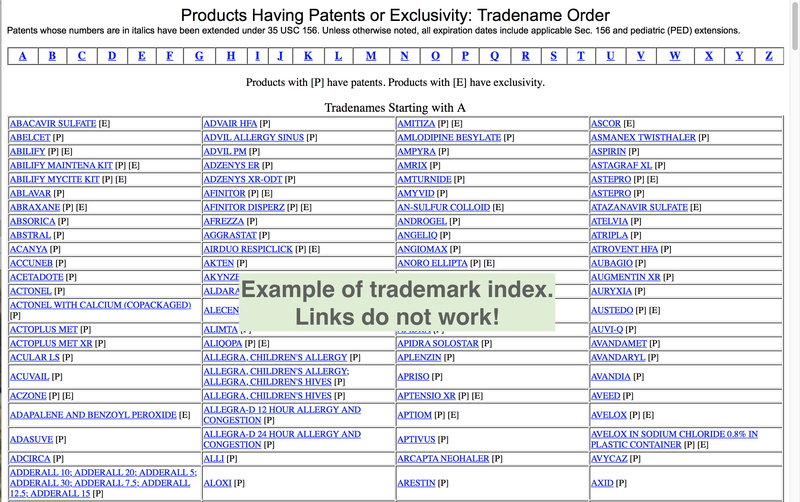 In all the above tables, each product that has a patent or exclusivity is linked directly to that product's information in the appropriate patent & exclusivity file. Please send any questions to Bruce Pokras at . Subscriptions are ordered through the Blazing Dawn Software account at the 2Checkout payment service. Payments may be made by a major credit card. You will first see the Terms and Conditions page. Windows is a trademark of Microsoft Corp. Macintosh is a registered trademark of Apple, Inc. Acrobat is a registered trademark of Adobe, Inc.